Other bead artists interpretations of my patterns. 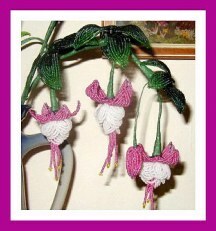 Diana Berns of New York grew this fuschia plant using the free pattern for April 2001. (See pattern archives). She says she is a beginner!!! I can't wait to see what gorgeous things she does with practice! Click on the image to go to the pattern! Tamara Shaffer created these gorgeous designs using the spiral button featured on About.com Beadwork. 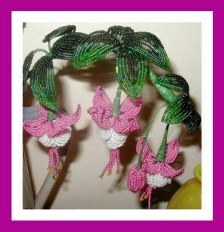 To see more of Tamara's fantastic beadwork, be sure to visit her site. 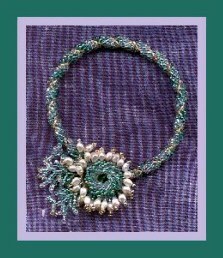 Barbara Sanderson created this stunning bracelet using the spiral button as the base for the pearl trimmed focal point. She made this & a matching necklace for a swap. Wish I had been her swap partner! Barb does not have a web site yet; but you may see the matching necklace & more of her gorgeous work on her Picture Trail Photo site. My daughter, Amy is also one of my primary Pattern Angels. This is her Entrelac bracelet done with #2 bugles & size 11 Miyuki seed beads. If you have used one of my patters & would like to share your efforts here, please send a scan or pic of your work. Include your name, website addy (if you have one) & your e-mail if you would like people to be able to reach you.